Work at the Institute of Sound and Vibration Research (ISVR) has led to a sophisticated new understanding of a number of complex challenges in acoustics known as multiple-input multiple-output (MIMO) problems. The research findings have attracted major industry sponsors and resulted in valuable new innovations in home entertainment, construction, aviation and defence. Engineers at the University of Southampton began work to tackle problems in acoustics caused by multiple sources of sound in the early 1980s when Stephen Elliott, Professor of Adaptive Systems, and Philip Nelson, Professor of Acoustics, were appointed as lecturers in ISVR. Since that time they have tackled a wide range of practical problems. An early example was the noise caused by the vibrations of the inner surface of an aircraft in flight. This is particularly acute in the cabins of propeller-driven aircraft. Early work involved the installation of multiple loudspeakers whose outputs could be controlled to cancel the radiation of the sound from the surface vibrations. Later research involved the controlling of surface vibrations by adding other ‘secondary’ vibration sources. Similar approaches are now being used to reduce noise and vibration in maritime systems that is based on recent ISVR research led by Professor Stephen Daley, Professor of Industrial Active Control. ISVR is committed to improving our understanding of acoustics and vibration and their impact on the wellbeing of the community and the quality and performance of engineering products. Formed in 1963, the Institute is internationally acknowledged for its contributions to reducing noise and vibration in engineering applications. Researchers specialise in rail and aircraft noise but also tackle fundamental work on understanding how humans hear sounds and process this information. This research has led to technical innovations such as improved cochlear implants and hearing devices which transform the quality of life for the hearing impaired and profoundly deaf. ISVR was recognised for its achievements with the award of a Queen's Anniversary Prize for Higher and Further Education in 2006. 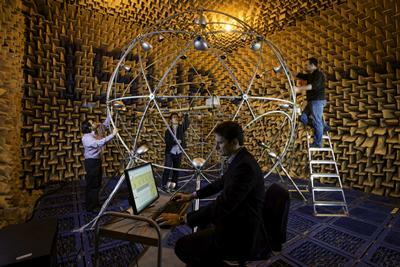 ISVR is well-known for its long-established research in reducing aircraft noise. The ISVR approach to the active control propeller aircraft interior noise has been successfully commercialised and is installed in aircraft flying world-wide. However it has proved to be valuable in other areas too. Similar technology developed at the ISVR is also being used to suppress noise and vibration in ships which can cause significant discomfort for passengers and crew; collaborations in this area include research with BAE Systems. Engineers at ISVR have partnered with Rolls-Royce through Southampton’s University Technology Centre (UTC) in Gas Turbine Noise to develop joint indoor testing systems for both noise and emissions of carbon dioxide and nitrogen oxides enabling the company to obtain essential data at reduced cost. Another major area of research at ISVR concerns the reproduction of sound. Japanese construction company Kajima Corporation wanted to simulate the acoustical environment of the buildings it designed and turned to Southampton’s researchers to provide the answers. The technology resulted from this collaboration has been commercialised in collaboration with Kajima and developed with several other partners. Pioneering work on tackling complex problems in acoustics has improved journeys for many millions of travellers. In aviation alone, systems developed at ISVR have been installed in a thousand planes to date, benefitting 177 million passengers worldwide. Noise reduction systems based on patents resulting from the unique ISVR methods are being developed for maritime use by BAE Systems. The underpinning science has also significantly cut the cost of noise tests on Rolls-Royce jet engines, producing significant savings to date and reducing their environmental impact. The impact of ISVR research in the area of sound reproduction has also been significant, resulting in patents that have enabled work to be commercialised through several partners including Yamaha, Marantz and Kajima Corporation. It continues today with collaborations with the BBC and the Japanese national broadcaster NHK.